Precipitate’s Initial Drilling Inte | Precipitate Gold Corp.
Vancouver, B.C. - August 1, 2017 - Precipitate Gold Corp. (the "Company" or "Precipitate") (TSXV: PRG) is pleased to provide diamond drilling results for the ongoing Ginger Ridge drill program at its 100% owned Juan de Herrera project in the Dominican Republic. Initial results from the current Ginger Ridge drill phase include analytical data from the first four holes drilled in the Main and South parts of the zone, totalling of 768 metres (holes GR17-12 to 15). Highlight results include the discovery of mineralization in a previously untested anomaly to the south of the Main zone yielding a 1.1 metre (‘m’) interval of 2.59 grams per tonne (‘g/t’) gold, (including 0.11% copper, 0.6% lead and 0.65% zinc) (GR17-15) and a Main Zone drill intercept of 14.73m of 1.16 g/t gold, including 2.67m of 2.23 g/t gold (GR17-13). Laboratory results are pending for eight holes, totalling 812 metres drilled at the Ginger Ridge East Anomaly (holes EA17-01 to 08). The laboratory analytical results for samples collected in holes 12 to 15 are summarized below. 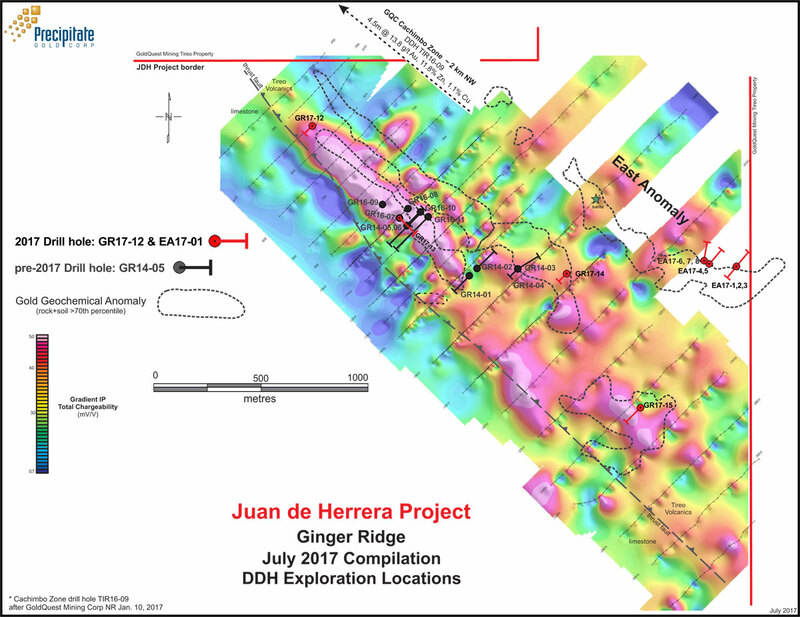 See the accompanying drill-hole location map and the Company’s website (www.precipitategold.com) for additional compilation illustrations. 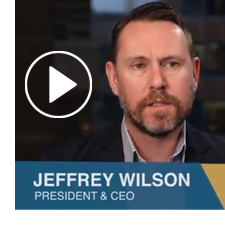 Jeffrey Wilson, Precipitate’s President & CEO stated, "We are encouraged by these results which include the identification of mineralization in the previously untested southern portion of the Main Ginger Ridge zone. Though the primary objective of the current round of drilling was to test the new Ginger Ridge EAST anomaly (approximately 1.0km east of these first holes), results from holes 12 - 15 continue to evidence the prolific nature of the broader Ginger Ridge area. This latest discovery warrants follow up detailed ground work and possible additional drilling, and validates the ongoing expansion potential of this area, as evidenced by the recent identification of Ginger Ridge East. Having encountered gold and elevated base metal values in core at Hole 15, we plan to mobilize ground crews back to the new southern area to complete follow up work in and around the hole as part of our ongoing effort to delineate additional drill worthy targets within this, and other emerging areas of the project. In the meantime, we anticipate results shortly from eight holes drilled in the latter stages of this program at the Ginger Ridge East anomaly." Holes GR17-12 to 15 were collared at various locations within the primary Ginger Ridge Zone, extending over a north-south distance of two kilometres. Drill holes tested surface and sub-surface gold mineralization and select induced polarization (‘IP’) chargeability and resistivity high geophysical anomalies. Hole 15, drilled 1.3 kilometres southeast of the 2014 discovery Hole 5, encountered mineralization related to the presence of quartz, pyrite, sphalerite (zinc), chalcopyrite (copper) narrow vein-fracture infills, rather than the semi to massive pyrite mineralization identified to the north. This southern Ginger Ridge area has a distinct gold-in-soil anomaly measuring approximately 400 metres in length coincident with an IP chargeability high anomaly. Follow up geological mapping and surface geochemical sampling will be completed in this area to delineate additional drill target. Hole 13 was drilled in a southeast direction at an inclination of -56 degrees, bisecting the Ginger Ridge zone’s highlight gold mineralization in hole GR14-05. Drill hole 13 gold results for this region are 14.73m of 1.16 g/t gold, including 2.67m of 2.22 g/t gold and a separate intercept of 12.97m of 1.05 g/t gold. Highlight results from hole GR17-15 include a 1.1m interval of 2.59 g/t Au, which also includes 0.11% copper, 0.6% lead and 0.65% zinc. The base metal credits result from the presence of quartz-pyrite-sphalerite and trace chalcopyrite enriched narrow fracture-veinlets hosted in siliceous dacite crystal tuff volcanics. Core samples were collected under the supervision of Michael Moore, P.Geo. HQ and NTW diameter diamond core was descriptively logged on site, aligned, marked for sampling and then cut in half, longitudinally, using a rock saw. One-half of the core is preserved on site in core boxes for verification and future reference. Rock samples were bagged, sealed and delivered directly to Bureau Veritas ("BV") preparation facility in Maimon Dominican Republic where they were dried, crushed and pulped. Sample pulps were then delivered to BV facilities in Vancouver British Columbia Canada for analyses (an ISO 9001 accredited facility). Samples were crushed to with more than 70% passing 2mm mesh and split using a riffle splitter (code PRP70-250). An approximately 250 gram sub-sample split was pulverized to minus 200 mesh (74µm). A 15 gram sub-split from the resulting pulp was then subjected to aqua regia digestion and multi-element ICP-ES/MS analysis (code AQ201) and an additional 30 gram pulp spilt subjected to fire assay for gold (ICP-ES finish) (code FA330-Au) for select gold sample results greater than 0.5 ppm; All coarse rejects and pulps are currently stored at BV. Certified standards and local limestone blanks were inserted into sample shipments as a quality control measure in addition to the internal quality control measures applied by the laboratory.